In a lot of big urban areas where a large share of residents lack health insurance, help isn't on the way. Seven of the 11 large metro areas where the uninsured rate was higher than the 14.5 percent national average last year are located in states that refused to expand Medicaid under the Affordable Care Act. Two are in Florida, three are in Texas, and the others are Atlanta and Charlotte, North Carolina. The metro area with the highest uninsured rate was Miami, at a staggering 25 percent, compared to the national low of 4 percent in greater Boston. 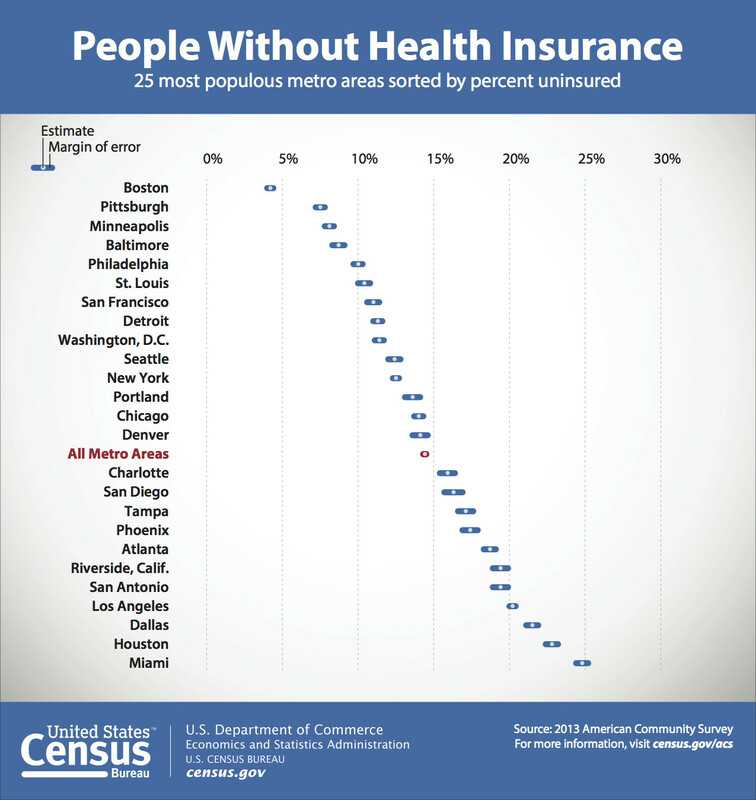 Here's a breakdown of the biggest metropolitan areas' uninsured rates before the Obamacare coverage expansion began, courtesy of figures released by the U.S. Census Bureau this week. The Affordable Care Act called for Medicaid benefits to be available to anyone earning up to 133 percent of the federal poverty level, which is about $11,500 for a single person this year. Twenty-six percent of people with incomes in this range were uninsured last year, the Census reported. To date, 23 states, mostly Southern, haven't adopted the expansion, despite generous federal funding. When the Supreme Court upheld the Affordable Care Act in 2012, justices also ruled the Medicaid expansion was optional for states. What makes matters worse for the people left out of the Medicaid expansion is that another part of the Obamacare law permits only people who earn at least poverty wages to get financial help paying for private health insurance -- so those who earn less get nothing. According to the Henry J. Kaiser Family Foundation, those decisions not to expand the program will leave 4.8 million people uninsured. More than 1 million of them live in Texas, 764,000 are in Florida, 409,000 are Georgia residents and 319,000 live in North Carolina. Four other large metro areas that the Census Bureau reported had higher-than-average uninsured rates are in states that expanded Medicaid this year: Los Angeles, San Diego and Riverside, California, and Phoenix, Arizona. In a survey published in July, the Commonwealth Fund found that the states that expanded Medicaid saw a combined drop in the uninsured rate for people with incomes below poverty from 28 percent to 17 percent after the first round of Obamacare enrollment. In the states that didn't, the share without health coverage was 36 percent -- barely changed from before. 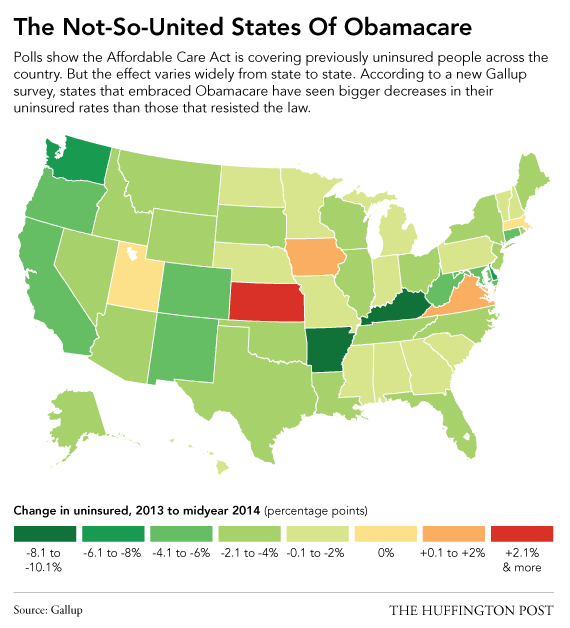 A Gallup-Healthways survey from August also revealed wide variation between Obamacare's effect on the uninsured rate between states that cooperated with the law's implementation, such as by expanding Medicaid, and those that didn't.